They do their work in secret, the goals of their missions and the discipline, teamwork, and skills needed to carry them out well out of the sight of the American public. However, on May 2, 2010, an elite team of Navy SEALs carried out Operation Neptune Spear, killing Osama bin Laden and launching “Black Ops” into the American consciousness. Among the imaginations captured by these elite forces was that of Nathan Edmondson, a writer (WHO IS JAKE ELLIS, DANCER) who was inspired to create THE ACTIVITY, a comic book series that follows the lives of members of the special operations group Intelligence Support Activity. Drawn by Mitch Gerads (with guest issues by Marc Laming), THE ACTIVITY depicts the training and covert missions of Team Omaha within the real-life organization with glimpses of the “regular” lives they live where no one knows about their real jobs. The insight into the lives of special operatives, as well as the bleeding-edge technology they employ in their missions, is founded on Edmondson’s desire to create a true-to-life depiction of life in Special Forces. A trip to Washington D.C., as well as extensive research and networking, yielded defense contractor contacts and sources within special ops. Edmondson’s commitment to accuracy won the aid of many of the book’s advisors, including Major Rusty Bradley of the US Special Forces, who co-scripted issue six of THE ACTIVITY. Major Bradley is the hero responsible for leading the team that took Sperwan Ghar in the decisive battle in Afghanistan, as is accounted in his book, LIONS OF KANDAHAR. Bradley’s co-writer, embedded Special Forces reporter Kevin Maurer, is an ongoing advisor to the book and wrote the foreword to the trade. The first trade paperback collection of THE ACTIVITY, containing issues #1-5, will be for sale on June 6 (ISBN 978-1-60706-561-6). THE ACTIVITY #7 is the launch of a new story arc, “Goat Hunt,” which sees members of Team Omaha being sent to Uzbekistan for their latest mission after incriminating evidence is discovered on a Chinese freighter. It was co-written by actual Navy SEALs whose identities cannot be revealed. It is available for pre-order now from the May issue of Previews and will be in stores on July 18. 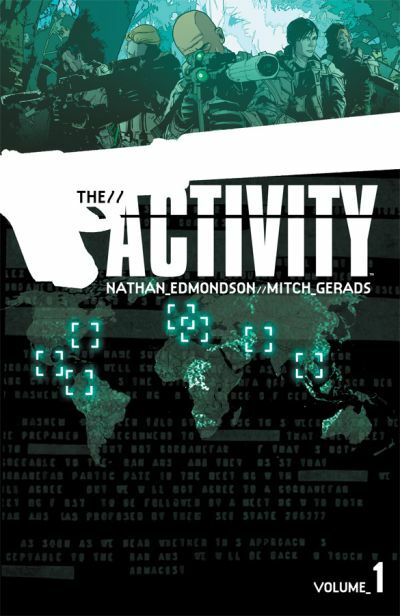 THE ACTIVITY creator Nathan Edmondson and artist Mitch Gerads are available for interviews and, as an added bonus, some their research contacts will also be answering questions along with them. Please contact Image Comics PR and Marketing Director Jennifer de Guzman at jenniferdeguzman@imagecomics.com to set up an interview with the team of THE ACTIVITY.